Texas School District Closures Are Rare, But Should They Be? There's little research that indicates closing districts will improve outcomes for students, but letting chronically low-performing and financially mismanaged schools stay open doesn't work either. In July, two Texas school districts received what amounted to notices of execution: letters from the state education commissioner saying that the Texas Education Agency was shutting them down. The reason? Years of poor academics and financial mismanagement. The result? Their students — and their tax dollars — would go to neighboring districts, which many residents feared would have a cataclysmic effect on local communities. It’s rare for the state to revoke the accreditation of an entire school district. Since 1995, it has only happened four times. The two districts marked for closure last summer, Premont ISD in South Texas and North Forest ISD in northeast Houston, challenged the decisions. And for the first time in TEA history, both of the districts, which are in the midst of sweeping reforms, have received one-year reprieves to make financial and academic turnarounds. Of the state’s 1,024 school districts, nearly 50 have been identified as “unacceptable” — which means fewer than 65 percent of their students passed state math exams and fewer than 70 percent passed them in reading. The ratings also take dropout and graduation rates into account. Those worst-performing districts serve a higher percentage of low-income and minority students — and on average, receive less in funding — than their higher-rated counterparts. Although there isn’t much research on whether closing a district helps students — and there’s indication that in certain situations it could harm them — some in the education community question whether the state is doing enough to monitor chronically poor-performing schools. Others wonder why the TEA isn’t closing more underperforming districts and why it takes the threat of imminent closure to galvanize such districts to action. Part of the problem is that closing a school district arouses strong emotions — and can be a political minefield. In the case of Wilmer-Hutchins, she said the “stars aligned” — there was such a mountain of evidence of mismanagement that the state was left with little choice but to close the district. Some community members were still unhappy with the decision, but Neeley said the district had been offered many opportunities to improve and instead progressed from “bad to worse.” In such a situation, she said, it was important for the state to have the ability to shut it down. After the district closed, Dallas ISD absorbed its 3,000 students. This year, Dallas ISD finally reopened the Wilmer-Hutchins high school campus. Although there is anecdotal evidence that Wilmer-Hutchins students are succeeding under the purview of a new school district, the effect on the community is unclear. The two districts facing the same sanction this year, North Forest and Premont, share little in common aside from serving mostly low-income students. At 7,300 students, North Forest ISD would be the largest district the state has shuttered; Premont ISD has an enrollment of just 570. Where Premont is overwhelmingly Hispanic and rural — located 70 miles outside of Corpus Christi — North Forest ISD is urban and predominantly black. If closed, North Forest students would likely go to schools in nearby Houston ISD; those in Premont would probably be absorbed into San Diego ISD, about 40 miles away. Residents in the North Forest and Premont communities argue that local control of districts — the lifeblood of their communities — is best for their students. But not much is known about how school closures affect student achievement either way, said Mary Filardo, the executive director of the Washington, D.C.-based 21st Century School Fund, a nonprofit that advocates for modernizing public school facilities to support high-quality education and community revitalization. Although closures can be necessary, Filardo said, they are nearly always “very disrupting and upsetting” for families. Studies have indicated that instability and mobility at the family level are detrimental to students’ learning, she said. But other advocates argue that Texas hasn’t been strict enough about shuttering districts — especially in situations where schools have experienced decades of poor academic performance and financial mismanagement. North Forest first faced state intervention in the late 1980s and has teetered on the brink of failure ever since. (A headline from a 1997 editorial on the district in the Houston Chronicle reads, “Clouds hover over northeast Houston district again.”) Like many rural districts, Premont has suffered for years from declining enrollment and failing to adjust its staffing, plunging into financial disarray. But David Anderson, a TEA lawyer, said the fact that closures are so rare is more reflective of the success of early interventions. Anderson also said he doesn’t expect TEA closures of districts to increase over the next several years, though he won’t be surprised if small districts get mired in financial trouble and require state intervention. For some critics, the plight of failing districts has also exposed chinks in the state’s accountability system. Designed to measure how well schools are educating students based on test scores and dropout rates, the system metes out one of four ratings to districts: exemplary, recognized, acceptable and unacceptable. If a district is rated unacceptable for two years, it can be closed by the state. When news broke in January that Premont ISD would suspend athletics to cut costs in an effort to avoid closure, state Rep. Scott Hochberg, D-Houston, vice chairman of the House Public Education Committee, requested information from the TEA on the average amount of funding each district receives and their accountability ratings. He said he found a correlation between funding and performance: The districts with the lowest accountability ratings get an average of $1,000 less per student than those with the highest such ratings. And districts that are rated unacceptable are overwhelmingly those with high percentages of minority and low-income students. States often focus on holding schools accountable over advising them on what they can do to better educate students — and that can have a detrimental effect on learning, said Pedro Noguera, an education professor at New York University who has worked with failing schools around the country and is currently helping North Forest in its turnaround efforts. 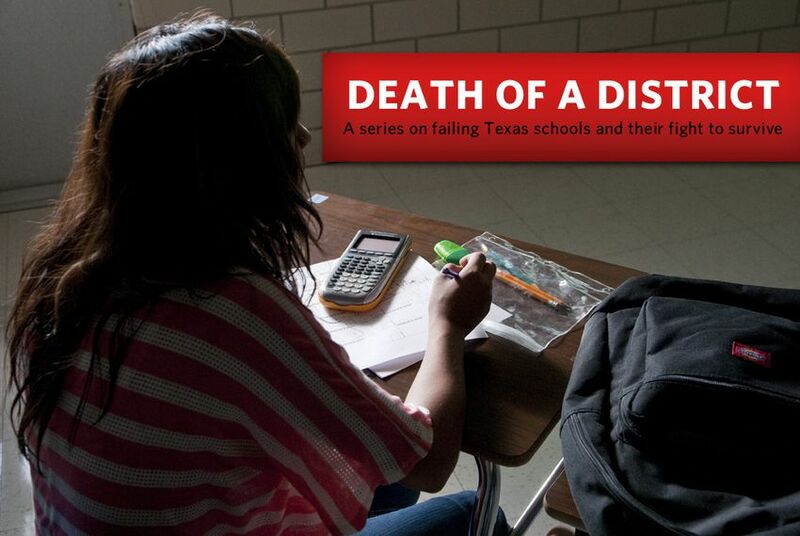 This is the first installment in a five-part series in which The Texas Tribune explores the struggles of failing school districts — and what's at stake for those who want them to survive. Part two profiles Houston's North Forest ISD and its efforts to avoid closure. Part three reports on the progress that Premont ISD has made after cutting sports to focus on academics and boost finances. Part four looks at a rebirth for schools in the Wilmer-Hutchins area after the local district was shuttered. Part five is a video report looking at whether the state system is helping failing districts.